True Believers, g’day to all. No new welcomes; that’s a change. Any additions? Collingwood 11.12.78 defeated the Western Bulldogs 9.10.64. Ground Reports – None seen. Did anyone go? C’mon people? Q4. Our game with us scoring 5 goals to their 2. I think this is when De Goey shifted to the Midfield freeing up Elliott in the Forward line. Both moves were successful. Numbers. My usual criticism relates to the conversion of Hit Outs to Clearances and onto Inside 50s and Marks Inside 50. So? Hit Outs -58 (us, courtesy Grundy) / 6 (them) – a massive advantage. See the conversion, next few steps. Clearances – 33 / 26 (Centre – 10 / 7; stoppages – 23 / 19). Marks inside 50 – 13 / 10. Marginal improvement. Contested Possession – 146 / 132. Tackles – 64 / 58. And Frees: 19 / 21. Phillips – 29 Disposals @ 69.0% Efficiency, 2 Clearances and 5 Tackles. Grundy – 23 Disposals @ 73.9%, 58 Hit Outs (including 17 Hits to advantage compared with 0 for his opponent), 6 Clearances and 8 Tackles. Roughead – 14 @ 92.9%. Adams – 28 @ 46.4% and 6 Clearances. A bit low; reduces the effective disposals to around 13. Pendlebury – 27 @ 70.4% and 5 Clearances. Sidebottom – 25 @ 80.0%. Moore – 20 @ 75%. Varcoe – 20 @ 75.0% and 4 Tackles.Great return. Langdon – 17 @ 90.0%. I should acknowledge Cox’s contribution particularly to the last two goals demonstrating an improved understanding of the game. Well done. As a team comparison, excluding Mayne, we had 7 players with a game Efficiency equal to or over 80.0%; they had 12. While this will always reflect the application of the opposition, I think we need to set a standard and pursue it. The 80% standard is my suggestion. Note that Phillips and Grundy both made the Team of the Week. Phillips is also recognised as our ‘Team Barometer’ – see https://www.afl.com.au/news/2019-04-16/stats-files-forget-dusty-danger-your-teams-surprise-barometer. In comparison, ‘the Bont’ had 36 Disposals @ 75.0% Efficiency; 8 Clearances and 6 Tackles. A pretty fair day at the office? Did we tag him? And Hunter (29 @ 96.6%) and Suckling (27 @ 92.7%) contributed. Reports. Mihocek’s ‘striking’ charge dropped. 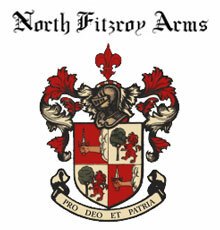 NFA. As if? Thursday, 18 April at the Gabba; bounce at 7.35pm. The Bears are currently 4th on the Ladder (percentage – 109.8%) versus us currently 8th (with 109.7%). Places are somewhat dynamic at the moment. This early in the season the numbers and place on the Ladder are pretty meaningless. The Bears have three Wins against the Eagles, North and Port. Then there was last weekend when Essendon destroyed them after a reasonably fair 1st Half. If the R1 performance by WCE is taken as an aberration (which I think is arguable) then the Bears’ wins over North and Port are less impressive and last week should be less surprising. Linda, your view? Midfield – Neale (C), Berry and/or Zorko (RR), and McLuggage (W). Backline – Witherden (HB) and, always, Hodge (from the BP). And , in a very successful Win over GWS in the NEAFL, Keays got 6 goals and Woller and Cutler were also strong Forward. Potential inclusions? As mentioned above, Brisbane’s Team Barometer is Mathieson, working most recently off the Interchange bench. That player with that famous Pies’ name, Starcevich, is still out injured. Therefore? Their Midfield is solid; this game will be won by the team that wins the Midfield battle – we should. Expect a significant improvement in our Forward Line to exploit the opportunity. Coming off a Win, against a top of the Table opponent, this game is important. Approach (same as last week)? Application? Work hard – note Brisbane’s quick starts (apart from last week). Midfield? We need to exploit our Ruck dominance, the direct link between Hit Outs and Clearances, around the ground as well as in the Centre. Watch their Midfield, potentially tagging Neale (or Zorko, who hasn’t made the Best list this season, yet, but can turn a game). Efficiency. Seek to meet the 80% standard. Look before you pass. Very pleased to see Varcoe back. Expect minimal change, except Beams return, though a few have now survived a couple of weeks in the VFL – Wells (Mid), Appleby (HB), Reid (Forward), Quaynor (HB) and Sier (Midfield). I’d be surprised to see any new apart from Beams. Weather? Wet but warm. 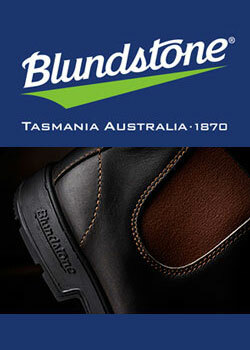 Get the boots with stops out; throw the moulded soul boots away. My prediction? Pies Win by 13 points. BOG – De Goey (much of the time from the Centre) – 37 Disposals @ 81.3% Efficiency, 8 Tackles, 6 Clearances and 3 Goal Assists. Cox, and Elliott get 4 each. Crowd – 41,000. Attendance? Anyone going? Ground Reports pls? Linda, your boys were going very nicely until last week. Are you going? I expect a very comprehensive Ground Report pls? Future. We have Essendon on Anzac Day. Could be interesting given what they did to the Bears last week and they have a Top 8 opponent, St Kilda, this weekend. Anyone attending Anzac Day? TV? Yep. 7mate from 7.30. My understanding is that in a marking competition where two players have their hands on the ball largely at the same time, the man in front is the recipient of the mark. Didn’t happen this time – Naughton awarded the mark over Moore, both with hands on, Moore in front. With my access through FOXTEL somewhat broadened, I have noted significant differences between different games, especially the ‘caught with the ball’, the highly topical ‘tackle against an opposing player’s lower leg’ and the justification for the awarding of a 50 metre penalty. And, we all agree, 50m is routinely much, much more. A 50m penalty forward of the Centre line is like being given a goal – I doubt the fairness of this. 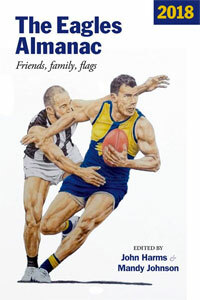 Footy Almanac. 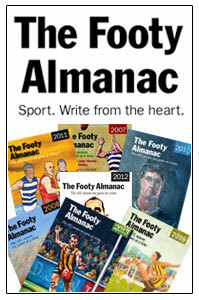 Remember that the content of these emails is published on the Footy Almanac website at https://www.footyalmanac.com.au/. Note the GWS / Dockers game at Manuka on Saturday, 20 April; bounce 1.45 pm. Wear your colours – enjoy. If someone in the ACT Government wanted to do the sums (as I did last year) I think they’d find that attendance at Manuka games is better than the GWS – home games. 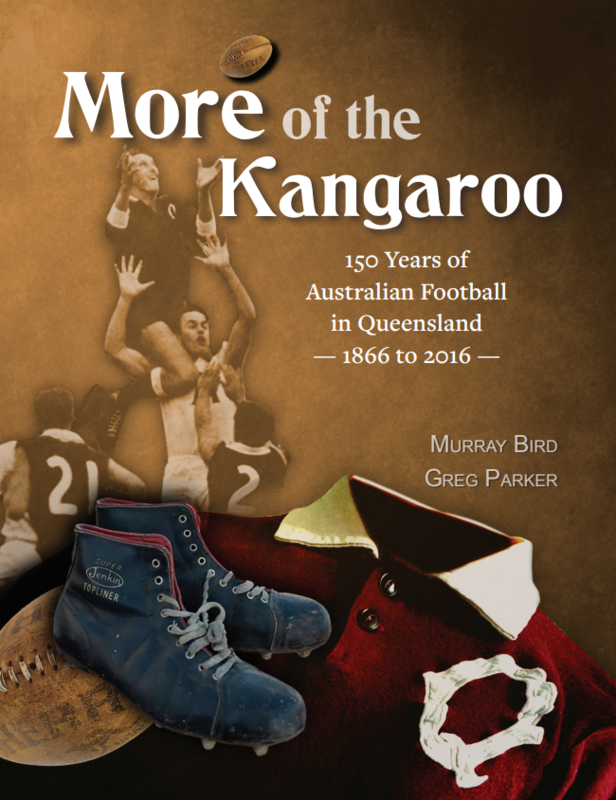 Want to encourage AFL games in town? Think about ways.